This image shows the view the bride had from her window while she got ready on her wedding day: deep green palm trees, the terracotta villa where her bridesmaids were staying, and a peek of the famous Cabo arch in the blue ocean. What a great scene to wake up to! 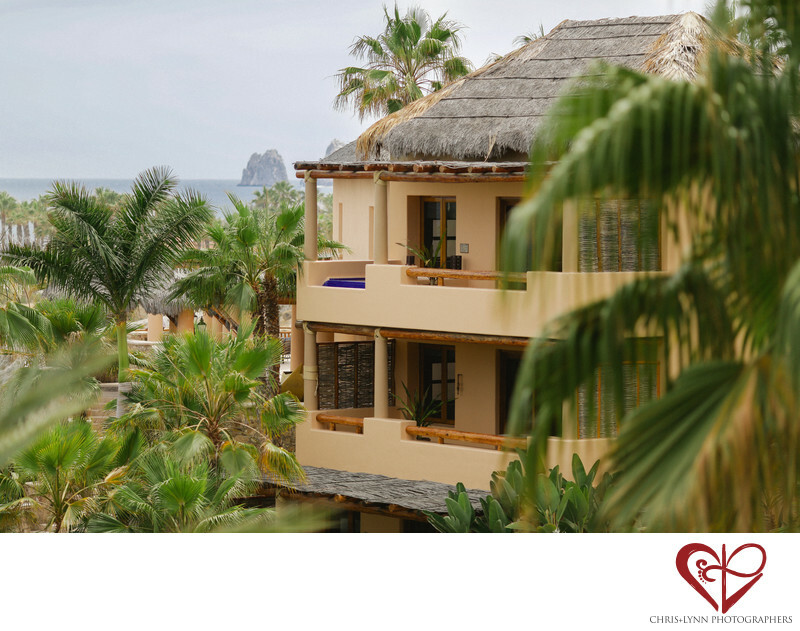 Views like this one are why so many couples fall in love with Esperanza Resort and choose it as their venue for their Mexico destination wedding. It was so relaxing for this bride to have her hair and makeup done and put on her dress in such a beautiful and serene environment. I love how lush the palm trees are and how each villa feels so private and secluded. We always like to take photos that really set the scene of the day and will bring back the memories of the special place the couple chose to celebrate their love. 1/3200; f/2.0; ISO 100; 135.0 mm.